1. 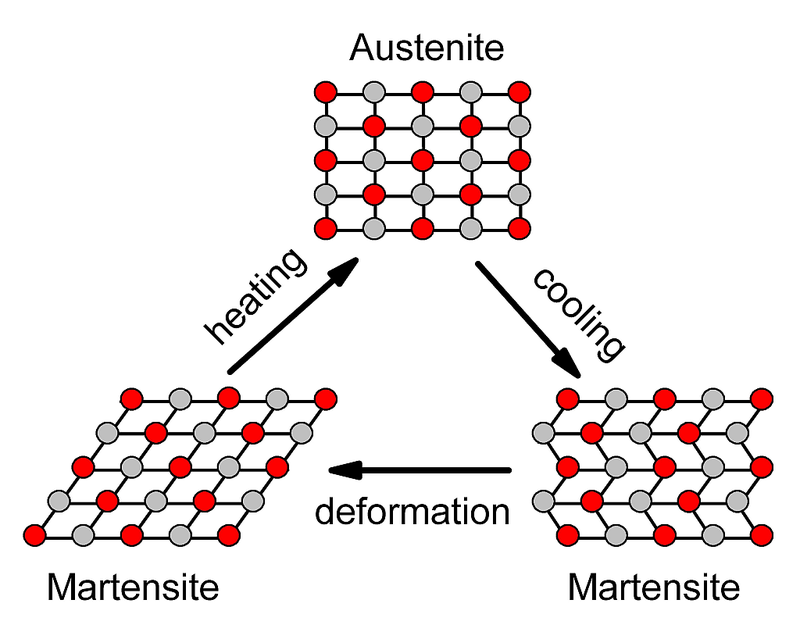 Austenite Phase - temperature is above activation temperature. The transition temperature varies depending upon the exact composition of the Nitinol alloy. Nitinol comes in many activation temperatures from 30°C (86°F) to 130°C (266°F). 2. Martensitic Phase - low temperature phase. The crystal structure is needle-like and collected in small domains. Within the small domains the needle-like crystals are aligned. The alloy may be bent or formed easily. Bending transforms the crystalline structure of the alloy producing an internal stress. 3. Annealing Phase - high temperature phase. The alloy will reorient its (cubic) crystalline structure to "remember" its present shape. The annealing phase for the Nitinol wire is 500°C. When Nitinol is at room temperature it is in the Martensitic phase. When the alloy is bent, the needle-like crystalline structure within the domains deforms, creating internal stress. When the alloy is heated above its transitional temperature (Austenite phase), the crystalline structure changes from needle-like to cubic. The cubic structure of the alloy doesn't fit into the same space as the needle-like domain structures formed when the alloy was bent. The alloy relieves the stress by returning to its "remembered" crystalline cubic shape. If the alloy hasn't any been deformed or stressed, the crystalline structure changes still occur, but it doesn't result in any net movement. What is the difference between Superelastic and Shape Memory Nitinol? Nitinol with shape memory could be easily deformed under the activation temperature. It behaves almost like a tin wire with one difference - it can't be bend to too acute angles. How to make a shape memory Nitinol from raw Nitinol? From raw Nitinol you could make shape memory Nitinol by annealing at the temperature about 500°C. It is neccessary to think about several factors which influence the properties of the annealed Nitinol. - time of annealing depends on the wire diameter. For 0,25mm wire it could be about 10 minutes, for 0,5mm wire it could be up to 20 minutes. Exact time have to be determined experimentally. - during annealing an oxidation occurs which change the ratio between Nickel and Titanium in the alloy and it could change the properties, specifically the activation temperature which may decrease. To avoid excessive aging it is recommended to quench the alloy in the water.